I arrived at the heart of theatre in Cardiff, the Wales Millennium Centre, having no idea what to expect! An all-male, comedy ballet were two worlds I never thought would connect in the way that they did, however, they were in fact the perfect combination. Being new to ballet, this show definitely changed my perception on the way this type of dance can be performed and is definitely one to start with if you’re a ‘newbie’ like myself. The production itself consisted of three sections and two intervals. Upon arrival I didn’t understand why there was a need for two intervals in a show that’s running time was less that 2 hours. However, after the first interval and the start of the second section, I realised that the set had completely changed and so did the theme of dance. The intervals also allowed me personally, to chat to some people who had been to the ballet before and gave me the opportunity to understand and appreciate this genre of performance further. The performances included were Les Syphides, Harlequinade Pas de Deux, Trovatiara de cinco, Dying swan and Paquita. Even though the show defied expectations of how stereo-typical ballet is performed, the classical element was definitely not lost. As well as having a lively and fun atmosphere, the elegance and grace of the dancers was demonstrated gorgeously through every leap and twirl on stage. I found that the comedy dotted through the show could not have been more perfectly timed. It kept the audience falling between complete absorption of talent and an abundance of giggles. The comedy was portrayed differently to how I had envisioned, which made it all the more refreshing. Purposely subtle mistakes in the performance is what made it funny. Facing the wrong way, bumping in to each other are examples of the way in which this was carried out and it was accentuated by the use of overly dramatic facial expressions. The costumes were well-designed for each dance and fitted the themes, ranging from delicate to vibrant, still keeping in touch with the classic feel of ballet. The show on a whole was beautifully hilarious, with delightful music and stunning performers! I would recommend going to see this show as it breaks general conceptions of male dancers in an enlightening and enjoyable way. Thank you to the staff at the Millennium Centre for being so helpful and welcoming on my visit! Find out what else is going on by clicking here. 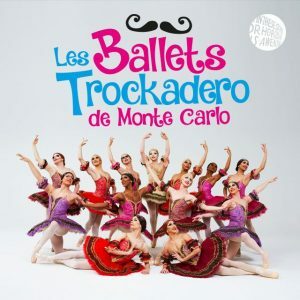 Visit Les Ballets Trockadero de Monte Carlo’s website here for news on upcoming shows.